April Fools’ Day may have passed, but we really had to check the calendar on this hack. [Damian Peckett] has implemented an Apple ][, its 6502 processor, and a cassette port, all on an Arduino Uno. If that wasn’t enough, he also uses a PS/2 keyboard for input and outputs analog VGA. [Damian] is doing all this with very few additional components. A couple of resistors, a capacitor and some very clever hacking were all [Damian] needed to convince an Arduino Uno that it was an Apple. Making all this work boiled down to a case of resource management. The original Apple ][ had 4KB of RAM and 8KB of ROM. The ATmega328 has only 2KB of RAM, but 32KB of Flash. The only way to make this hack work would be to keep as much of the emulation and other routines in Flash, using as little RAM as possible. The core of this hack starts with the MOS 6502, the processor used in the Apple. [Damian] wrote a simple assembler which translates the 6502 opcodes and address modes to instructions which can be executed by the Arduino’s ATmega328. To keep everything in ROM and make the emulator portable, [Damian] used two large switch statements. One for address modes, and a 352 line switch statement for the opcodes themselves. A CPU alone is not an Apple though. [Damian] still needed input, output, and the ROM which made the Apple so special. Input was through a PS/2 keyboard. The PS/2 synchronous serial clock is easy to interface with an Arduino. Output was through a custom VGA implementation, which is a hack all its own. [Damian] used the lowly ATmega16u2 to generate the video timing. The 16u2 is normally used as the Arduino Uno’s USB interface. The only external hardware needed is a single 120 ohm resistor. The original Apples had cassette and speaker interfaces. So does this emulated Apple. [Woz’s] original cassette and speaker interface accurate loops to generate and measure frequencies. One of the trade-offs [Damian] accepted in his 6502 was cycle accuracy, so he couldn’t use the original routines. Not a problem though, as he was able to write simple functions to replace these routines and drop them in place of the Apple’s own ROM calls. The Apple ][ ROM itself is handled as one giant character array. This includes the system monitor, Mini-Assembler, Sweet-16, and [Woz’s] own Integer Basic. [Damian] caps off this incredible project by booting his new computer, loading a Mandelbrot set program from cassette -or in this case an audio file stored on his cell phone, and running it. The well-known fractal is displayed in all its glory on a modern LCD monitor, driven by a microcontroller, emulating a computer from nearly 40 years ago. Thanks for the tip [Bill]! 2011 has been a tremendous year for tech -- Amazon launched a $200 Android tablet, AT&T and Verizon continued their LTE expansion, Apple killed off the Mac mini's SuperDrive and Samsung introduced a well-received killer 5.3-inch smartphone. But tiny tech startups made their mark as well, proving that you don't need an enormous R&D budget to spur innovation. Still, development isn't free, and unless your social circle includes eager investors, seed money has been traditionally hard to come by. For many of this year's indie devs, crowdfunding sites have been the answer, with Kickstarter leading the pack. We've seen an enormous variety of projects -- including a deluge of duds and plenty more semi-redundant iPhone accessories -- but a few treasures soared above the swill to be featured in our Insert Coin series, with many of those meeting their funding goals and even making their way into the hands of consumers. Now, as 2011 draws to a close, we've gone through this past year's projects to single out our top ten, and they're waiting for your consideration just past the break. Insert Coin: A look back at ten top projects from 2011 originally appeared on Engadget on Sat, 31 Dec 2011 16:00:00 EST. Please see our terms for use of feeds. 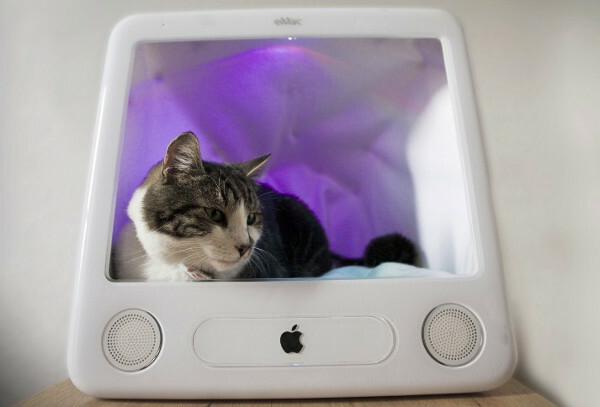 eSleeper combines cats, Arduino and Twitter in an eMac shell (video) originally appeared on Engadget on Thu, 01 Dec 2011 06:34:00 EST. Please see our terms for use of feeds.